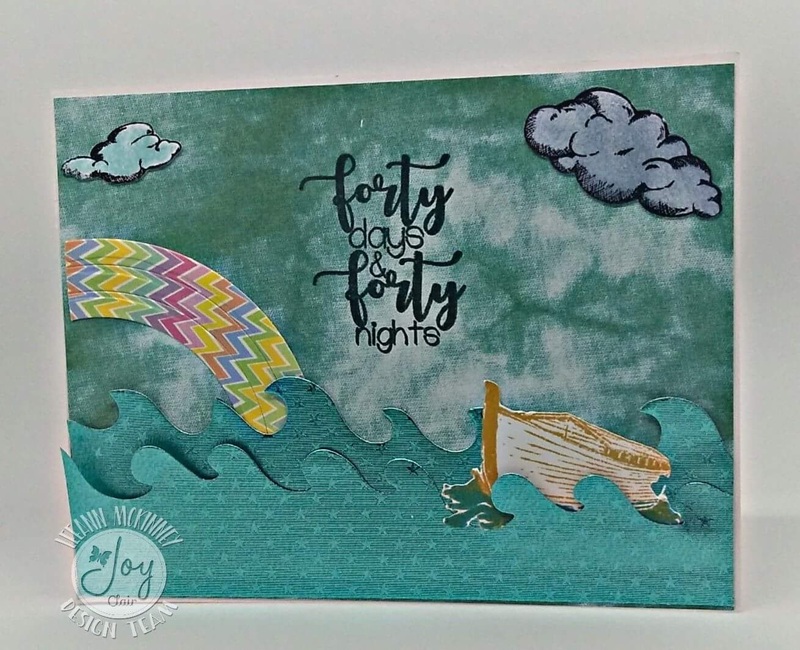 Greetings friends and fellow crafters, LeeAnn here today with two projects using stamps from Joy Clairs Color By Faith line and Rinea Foil Papers. I had never used this paper before, and I really do find that I like it. As you will see in my two projects today, the foil works great with both embossing folders and dies. 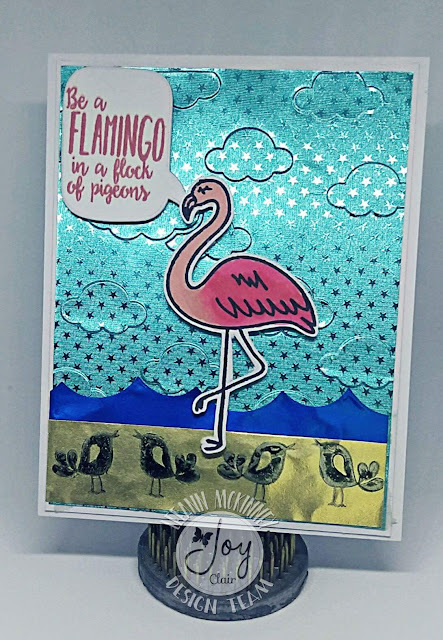 For my projects today I used Be a Flamingo and Noah's Ark stamp sets that were in the August 2017 release. For my first project "Be a Flamingo" I started with Recollections 110 lb white card stock, and cut to a2 size top folding card base. I then cut a layer slightly smaller at 4" x 5.25". My layer of Rinea paper is 3.75" x 5" and embossed with a cloud embossing folder and affixed with double stick tape. I used a cloud die to cut the waves from dark blue foil paper and the gold is to be the sandy beach. I stamped the flamingo and cut her out with my Scan n Cut 2 machine, I really love being able to stamp and scan my images, however with each stamp set purchased from JoyClair.com you will be emailed the electronic file to cut the images with your cutter of choice (Silhouette/Cricut/Brother). My Flamingo is stamped using Memento Tuxedo Black and the sentiment is stamped using Ranger Salmon. I used my Spectrum Noir Markers to color the image. Along the bottom of the card I stamped the birds from the Song of Solomon stamp set which was released in 2016. I thought of these little birds as soon as I saw this stamps set was coming out, and knew immediately my project would be similar to this. The birds are stamped using Staz-On ink. My second project today is using Noah's Ark. The background while I would love to take credit for the stormy look, is from the DCWV "the Girlhood Stack" released in 2012. The rainbow is from a DCWV 8x8 pad however I can not find the name of it at this time. And cut with an MFT die. The clouds and sentiment were stamped using Memento Tuxedo Black, the ark was stamping using GinaK Honey Mustard. The clouds were colored using Stormy Sky and Broken China distress Inks. The water waves were cut using some wave dies from my stashed, and it was all put together on an A2 card base from Recollections 110 lb card stock.